The German Luftwaffe appears to be a never-ending source of inspiration for historic writers and researchers alike. Jean-Louis Roba’s Foreign Planes in the Service of the Luftwaffe is a title which should arise interest among those who already know quite a bit about the Luftwaffe and its general history. Such readers will already know that the Germans made use of various foreign aircraft. The notorious KG 200 comes to mind, along with Zirkus Rosarius or some odd experiments with the British Spitfire under the auspices of Daimler-Benz. Jean-Louis Roba is an accomplished aviation historian living in Belgium. His previous work includes books like Les Belges dans la RAF, the history of Belgians in the Royal Air Force; Les hydravions de la Luftwaffe; or the pivotal Jagdwaffe series written together with Eric Mombeek and Martin Pegg. 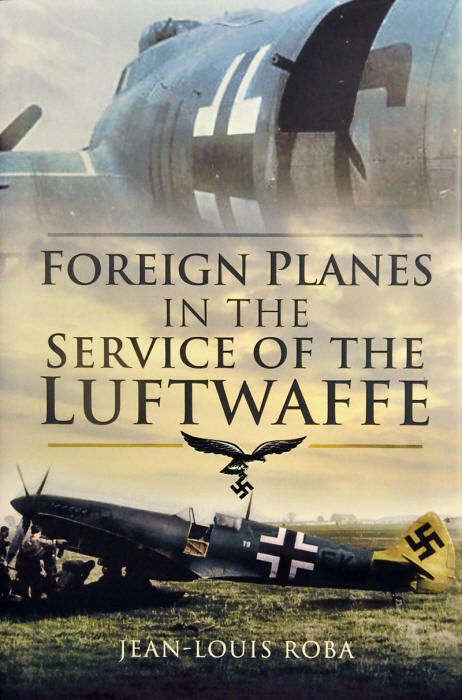 Foreign Planes in the Service of the Luftwaffe is the newest title from this author. His newest book carries a promise of exploring a relatively obscure yet intriguing area of German air operations. Right or wrong, when opening Foreign Planes in the Service of the Luftwaffe, my expectations were initially set on learning more about the fate of captured Allied aircraft in German hands. 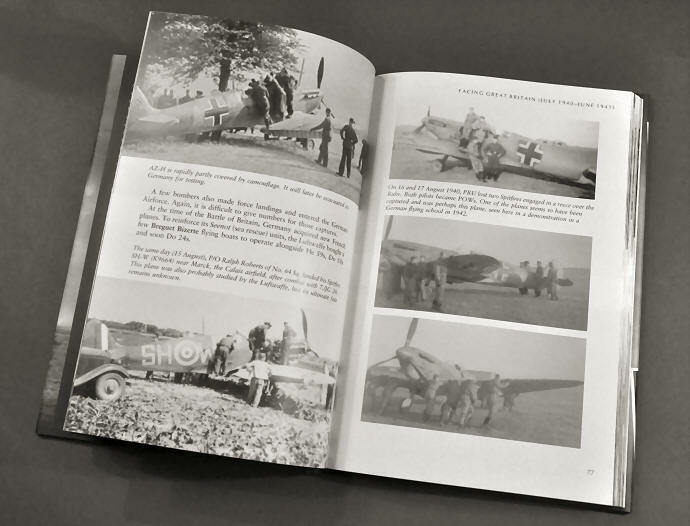 This preconceived image was somewhat reinforced by the book’s colour sleeve, showing a photo of a Spitfire Mk. XI with prominent Luftwaffe crosses, and another of a similarly treated B-17. The first look inside this volume brought two surprises. Firstly, the entire book is organised around an impressive photo collection, counting hundreds of pictures – great quality in a publication such as this. Indeed, the text content is limited to a short summary at the beginning of each chapter; the rest of the story is told entirely by the pictures and their captions. The second surprise was my realising that the subject is actually very much broader than captured Allied aircraft. Instead, Roba attempts to examine the full history of foreign aircraft utilised by the Luftwaffe – meaning aircraft of all types, from all sources which offered themselves to the Germans during the years 1938-1945. Foreign Planes in the Service of the Luftwaffe is basically a photo album in which the main portion of the narrative is formed by image captions. Contrary to the common myth, the Luftwaffe was never overwhelming its primary opponents in terms of sheer numbers; even at the time of the Battle of Britain, British fighter production exceeded that of Germany. Indeed, shortage of aircraft caused by limited industrial capacity was something of a permanent occurrence in Nazi Germany. As formidable as the German air force could be in the front line, it was chronically lacking key equipment such as modern transports, trainers, heavy long-distance or communication aircraft. It is primarily for this reason that the Germans routinely incorporated flying machines of the conquered nations into their own ranks. Unreliable source of supplies as it was, aviation war booty proved essential for the Luftwaffe to endure and cope with the massive tasks that it was confronted with during the war years. Jean-Louis Roba puts a thesis that no other country at the time made the more extensive and systematic use of captured aircraft than Germany. Foreign aircraft in the Luftwaffe came primarily not from that country’s conquests in the air, but on the ground. Starting with Austria, through Czechoslovakia, Poland, the Low Countries, France, Russia and finally, the occupation of Italy – all territorial expansion brought rich war booty, also in the form of combat aircraft of the subjugated countries. Thus the book begins with the Anschluss of Austria and the incorporation of that country’s ageing fleet of Fiat CR.32s into the fighter units of the emerging Luftwaffe. Czechoslovakia became the first source of truly modern combat aircraft, and there were even attempts to equip German combat units with thus acquisitioned Avia B.534s. Not much valuable war booty was retrieved from Poland, Denmark and Belgium, but victory over France supplied the Germans with massive amounts of usable aircraft, substantially supporting their entire flying school programme for the years to come. French Curtiss H.75s were also tried for first-line service, but were eventually sold to Finland. And so the story goes on. Supply of Italian aircraft, especially as the country fell into German hands in 1943, partially saved the dramatic shortages of heavy air transport in the post-Stalingrad period, when Luftwaffe resources were so badly overstretched on all fronts. The Germans also supplied their Allies with foreign aircraft – Romania with captured Polish aircraft, Finland, Bulgaria and Italy witch ex-French ones. Starting with 1941, Allied air offensive resulted in many aircraft making emergency landings in the occupied countries, and thus it supplied the Germans with substantial numbers of such aircraft. Conditions in Western Europe, with its dense web of railway lines and availability of heavy machinery and road transport, were favourable for salvaging captured enemy equipment. Relatively few aircraft were obtained in flying condition (there were even notable appearances in Nazi propaganda films), many others were used for technical intelligence, as sources of spares, for public displays or finally to complement dwindling supplies of light alloys within the Reich. The list seems to have included most of the Allied types then in service – with examples of Spitfires, Blenheims, Hurricanes, Hampdens, Lysanders, Bostons, Thunderolts, Fortresses, even a lone Beaufighter. Some chapters of the book – not all – are devoted to captured Allied aircraft such as these Spitfires. Foreign Planes in the Service of the Luftwaffe is a highly interesting book which addresses a relatively obscure chapter the history of the Luftwaffe. I wouldn’t call this book definitive; it probably couldn’t be, as much of the relevant German official documentation which undoubtedly existed at the time was either lost or destroyed. However, it provides a representative overview of the subject, surprising with its width and the multitude of photographic material which must have taken years to collect. In the nit-picking department, I spotted one or two minor errors (such as Greek PZL P.24 identified as P.11), which do not retract from the overall good impression of Jean Louis Roba’s work. 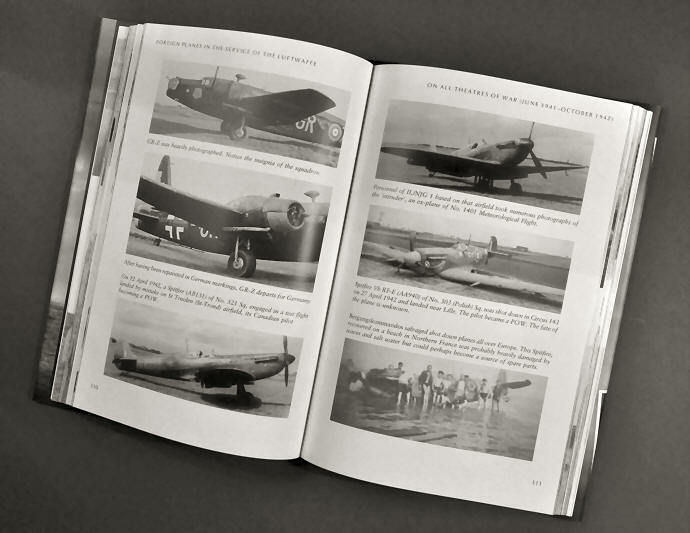 Also, there is a small but annoying editorial slip: while the Contents page lists the separate Appendix with the Colour Photos of the Beuteflugzeugen (p. 213), there are no colour images to be found throughout the book. Regrettable. Because of the excessive photo content, Foreign Planes would probably be better served if printed in a larger format. On the other hand, the quality of image reproduction is good enough. Either way, at a quoted price (now around £15.00) this book can be considered a bargain! Recommended purchase, especially if the Luftwaffe remains in the centre of your aviation interest. Just a comment on the review. The “Greek” PZL P-24 is actually a Romanian PZL P-11. The only P-24s with an open cockpit were the prototypes. Obviously the roundels confused the author. Ah, and the “Yak” at the top of page 96 is actually a MiG-3. three biplanes in the second row are also Hs-123s. I hope that these observations will be useful to potential buyers of this book. is of course an SM-79. Also notice the He-114 float plane next to it (ex-Romanian???). interesting aircraft in the background not mentioned in the captions. @pk1376. Your comments have been very appreciated, obviously you have scrutinized the book much more thoroughly than I did :). I agree that many of the pics deserve in-depth study. And please never hesitate to add another comment if you like.